Roses are one of the most loved flowers of all time, they are a symbol of romance & friendship and are one of the oldest cultivated flowers. Growing roses in the varied Australian climate can be daunting but the reward you reap when harvesting this flower can far outweigh the challenges you might face. Hybrid Tea Roses – the most popular and well known of the family. They are the classic shape based on long, strong stems and come in a vast range of colours such as red, yellow, white, purple and orange. Floribunda Roses – this variety of rose grows its flowers in clusters and are a fusion of the hybrid tea rose and polyantha rose. Climbing, Rambling and Pillar Roses – these roses boast large trusses and come in many different colours and fragrances. They produce long climbing stems which allow them to wrap around frames, pillars and arches. Miniature Roses – this variety of rose, which is normally found on a sturdy bush or potted, may be small in size but are extremely hardy and resilient to the harsh Australian weather. They come in a range of colours and fragrances. Shrub Roses – these refer to the traditional large bushes of roses seen in many gardens across the world. These classic shrubs are generally low maintenance and come in a range of bright colours. Roses are generally an easy to care for plant, once they’ve established themselves in your garden and you’ve show them some TLC, they promise to reward you for years to come with stunning blooms and fragrant scents. Position: Choose the position of your roses very carefully. Roses love the sun and for them to grow and prosper they’ll ideally require around 6 hours of sunlight per day, so it’s best to plant them in a spot where they’ll absorb the morning sun. Roses don’t care much for other plants so it’s best to have them in their own bed and ensure you keep any weeds under control. If the area tends to be exposed to the elements, you might want to consider a windbreak such as a solid fence or hedge. Soil: Roses like soil that offers suitable drainage, is nutrient rich and slightly acidic – with a pH around 6.5-7. If you need to improve your soil before planting it’s advisable to add an organically based fish fertiliser such as Charlie Carp’s All Purpose Liquid or Certified Premium Organic Liquid or use organic matter, such as cow manure or compost, before planting. Water: Roses require more watering than most garden plants throughout the year. The first year of a roses life is when it will be most porous and require a dedicated watering plan, this will help the young roots to establish and grow. A tested way to water new roses is with drip irrigation, as it concentrates the water at the root, where it’s required the most. It’s also important to keep a thick layer of organic mulch to keep the moisture in and protect the root of the plant. Fertiliser: Roses thrive off a constant supply of nitrogen, potassium and phosphorus. A high quality organically based fish fertiliser (such as Charlie Carp) in either a liquid or pellet form is perfect to provide these nutrients to the plant. Charlie Carp is a perfect fit for roses as it can also be mixed with other green products such as Eco-Oil and Eco-Fungicide, providing defence against pests and diseases. These elements will also help to moderate the pH of the soil. It’s important to remember not to fertilise the rose plant immediately after planting, wait until the flowers have started to show colour. Fertilising should be done three times a year in spring, the start of summer and at the beginning of autumn. Feeding any later than this will encourage new growth that will only become damaged in winter. 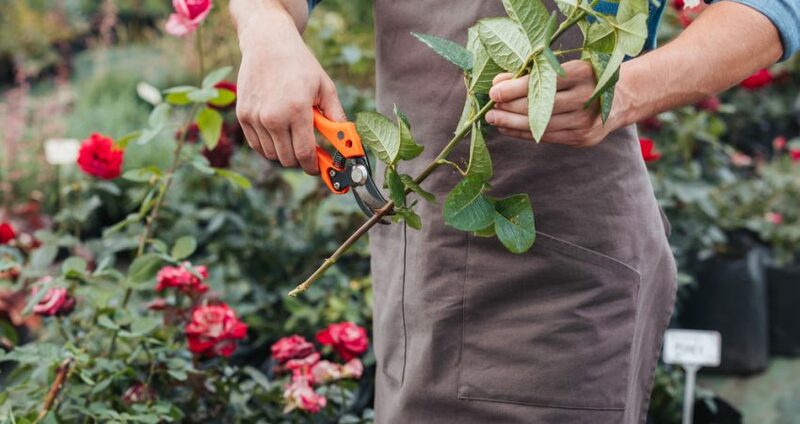 Pruning: Pruning is imperative when it comes to roses, this allows them to get rid of all the old, dead elements and will reinvigorate them, so they can produce a new batch of blooms. Various type will require additional pruning at different times of the year, but all roses should be pruned in winter (June/July or early August). You should remove the dead & unproductive wood back to reveal the younger smoother bark. Minimise branch crowding by removing crossed over branches and cut out any twiggy growth. Please note, rose types that only bloom in spring should only be pruned after flowering and not during the winter. Climbing roses will require further attention as they not only need pruned but also trained. Cut down the side shoots to around 10cm however, do not prune the main stems and train the main shoots to grow horizontal (this will allow for more flowering). If you are growing roses on pillars or arches the climbing roses with need to be trained in a spiral fashion. Pest & Disease Prevention: The best way to avoid pests and disease is to start with a disease-resistant variety of rose plant which is kept well hydrated and fertilised with organic fertiliser. It’s also a good practice to ensure the plants have good air circulation. Make sure to remove any diseased foliage on a regular basis and if you should see any fungal infections spray every two weeks with a fungicide. Roses are certainly not the easiest of plants to tend to as they do require attention throughout the year but with the proper care and maintenance they promise to deliver beautiful blooms year after year. The famous roses of Flemington Racecourse have been grown using Charlie Carp for over 10 years now. You can read our testimonial from Terry Freeman, Senior Manager – Grounds and Gardens Flemington Race Course. So it’s safe to say we know a thing or two about growing roses in Australia. If you’d like to learn more about roses and how best to fertilise, please contact us here at Charlie Carp.